Hitachi's newly released education projector, the CP-X2010N, is running on all cylinders. This 7.7 pound, 2200-lumen XGA projector has the feel of a product that has had some serious thought put into it. Blackboard mode and 16 watts of audio make it versatile enough to use in any moderate-sized classroom. A 6,000-hour lamp life makes it economical to run, and a three-year warranty means you're covered if it ever breaks down. The CP-X2010N sells for under $800, which makes it a great bargain. Light Engine: 1024x768, native 4:3 3LCD, with 210W UHP lamp. Video Compatibility: Up to 1080p/60. Connection Panel: 2x VGA input, one VGA monitor pass-through, one YPbPr component input, one composite input, one s-video input, one USB port, one L/R RCA audio input, one L/R RCA audio pass-through, 2x 1/8" audio inputs, 9-pin serial port, Kensington lock. Lens: 1.2:1 manual zoom/focus lens. High lumen output. Rated at 2200 ANSI lumens, the CP-X2010N is a fairly bright projector. And, true to form, we measured a real-world maximum lumen output of 2186 lumens. This is plenty of light to display a pleasantly bright 100" diagonal image in a classroom with some moderate ambient light. With the lights turned down, it's enough for a truly striking high-contrast picture. Excellent brightness uniformity. While not critically important in most classroom situations, a lack of brightness uniformity can cause the image on screen to appear unevenly lit. The CP-X2010N measured an outstanding 96% brightness uniformity, which is performance rivaling that of the best home theater projectors, let alone education models. Blackboard modes. In some situations, a classroom will need a projector but lack a screen. In these cases it is often most convenient to project on a large, flat surface that is already the center of attention in the room - namely the blackboard. The CP-X2010N has image modes for blackboards, greenboards, and whiteboards, which color-correct and adjust lumen output for times when you're forced to project on these materials. Monitor pass-through. The CP-X2010N also has monitor pass-through. Not all computers have the ability to support multiple monitors, making it more difficult - if not impossible - for the educator to use a projector and a monitor at the same time. By adding monitor pass-through, a computer with support for only one monitor can be connected to the projector, then reconnected to the monitor, effectively side-stepping the issue. Sharpness. The CP-X2010N has very good edge-to-edge sharpness, so the far corners of the screen are just as crisp and clear as the center, even when displaying an entire screen of text in a small font. While this is sometimes taken for granted, it is not uncommon for inexpensive projectors to have imperfect edge-to-edge sharpness that can make some areas of a page of text look soft or even fuzzy. No such problem exists on this one. Powerful sound. Unlike most projectors in its weight class, the CP-X2010N has a speaker that can be described as something other than anemic - in fact, it's downright powerful. This puppy puts out sixteen watts of sound, which is among the most potent we've seen on this class of projector. To see just how loud it could get, we played a -12dB, 400Hz tone and took a sound pressure reading. Inside of three feet, the speaker on the CP-X2010N can actually be hazardous to your hearing, reaching nearly 88dB. As far as sound quality, it had a slightly tinny quality due to the lack of bass. But overall it is far superior to most on-board audio on digital projectors, and it is a very attractive feature. Another interesting feature is audio pass-through, which allows the speaker on the CP-X2010N to be used even while the projector is in standby mode. If the speaker on the projector is the only sound system available, this can be a useful tool. Security. Of course, a new classroom projector isn't any good if it gets stolen, and teachers cannot keep an eye on the projector all day long. To this end, Hitachi includes both a Kensington lock point and a loop for a cable lock, as well as password protection on the projector itself. If enabled, the projector displays "Enter Password" upon startup, and gives the user three chances to enter the correct password, after which it shuts down. This should help keep tampering to a minimum, and might serve to discourage theft as well. There is also a feature called "Transition Detector," which internally makes note of the projector's current (vertical) angle. If this angle changes while the projector is off, it will not display the input signal, rendering it useless. This feature is best suited to projectors in a permanent mount, such as a ceiling mount, since projectors on rolling carts tend to undergo more adjustment than their stationary counterparts. Transition Detection is optional and disabled by default. Lamp Life. The CP-X2010N, at its maximum lumen output, can go 3,000 hours without a lamp change. While this is already 50% more than many education projectors, the CP-X2010 can go a whopping 6,000 hours in eco-mode. Lumen output in eco-mode drops from 2186 lumens to 1421 lumens, or a reduction of 35%, so you may need better light control in your classroom or the use of a smaller screen to take full advantage of the improved lamp longevity. Combined with the projector's hybrid dust filter which only needs cleaning every 5,000 hours, maintenance on the projector is minimal. Fan noise. 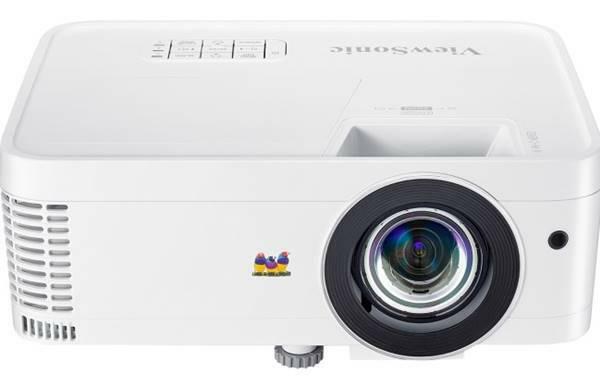 Despite its impressive brightness, the CP-X2010N is one of the quieter mobile/education projectors we have seen, which makes it more pleasant to use in small rooms. It also expels less waste heat than comparable units, which is appreciated in smaller rooms where air temperature changes quickly. Wired networking. The CP-X2010N differs from the CP-X2010 in its networking capability. The 2010N has an RJ-45 wired networking port, which allows the projector to be controlled and monitored remotely. This capability adds another layer of security - monitoring your network will tell you if a projector has been disconnected. It also allows the IT department to turn off any forgotten projectors at the end of the day without leaving the office. Of course, as this is a wired networking solution, it will be difficult to use if the CP-X2010N is on a rolling cart. Keystone Correction. One of the few limitations of the CP-X2010N is its keystone correction, which is not as clean as it could be. The image exhibits some of the bolding effect present in most keystone correction, but it is not applied consistently - there is a wavy appearance that varies depending on how much correction is applied. While this does not make the image unusable or illegible by any stretch, it is somewhat annoying. However, keystone correction is not an issue unless you are forced to use it. Throw angle. The CP-X2010N has a throw angle such that, if the projector is level, the image appears 92% above the centerline of the lens and 8% below. That means you may have to tilt the projector in order to put the entire image on screen. That in turn means you must use keystone correction to square it up, or simply live with a trapezoidal image. The Hitachi CP-X2010N has almost everything you could want in an education projector. It is small enough to be used on a rolling cart and powerful enough to light up a screen without turning all the room lights off. It has a quiet fan and a loud speaker. It is portable, but theft-resistant. It can be used on a dedicated screen or a repurposed blackboard. It is, in short, a well-rounded projector that can be adapted to a myriad of classroom applications. Its low price and long lamp life make it a smart choice for schools trying to keep costs low. In the coming months, we will be reviewing quite a few education products, and as such we are withholding our five-star ratings until we have a chance to do more comparative testing. However, the CP-X2010N is a strong product regardless of the competition, and it earns a place among our Highly Rated projectors for its combination of dynamite performance and low price. Going by the innovations and Hitachi being an inventor and we at ABCOM being the sole distributors of Hitachi Projectors for the UAE, we take pride in what Hitachi offers. The products they come out with are of high standards and very reliable compared to many other projectors that are available in the market. Only drawback however, not very relevant though, is the external looks of the projector may not be so appealing, but what runs inside is unique to the brand. Those in this part of the world, can readily buy an Hitachi and find the value for money. The review above has been true to its claims. I bought one of these used for only $75 with only 650 hrs on the lamp. Its awesome for a home theater projector, which is all I use it for. It just has VGA input, no hdmi, so I bought a $15 converter so I can play blue rays on it. It also displays in 720P only, as I understand, but its plenty good, and plenty quiet. I love it.